A wide range of good and bad organisms lives in the soil. Collectively referred to as the soil food web, they are critical to the health of your garden. 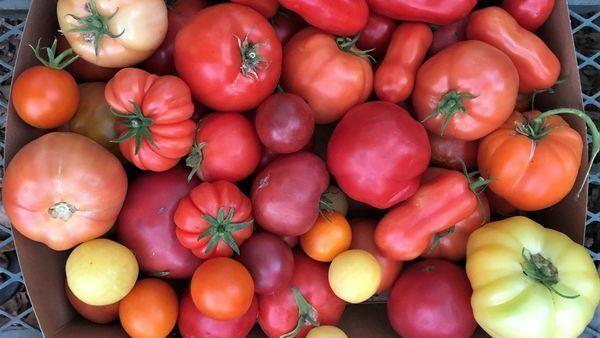 A few years ago, only a handful of people in the country had heard the term “soil food web.” Now it’s cropping up everywhere, and gardeners are wondering what on earth it means. The term was coined by Dr. Elaine R. Ingham, president of Soil Foodweb, Inc. (www.soilfoodweb.com) in Corvallis, Oregon, and it refers to the relationships among the wide range of living organisms found in soil. The soil food web is similar to the food chain, except that the typical food chain is linear, while the soil food web works from the premise that everything that can eat or be eaten is involved in a cyclical relationship. 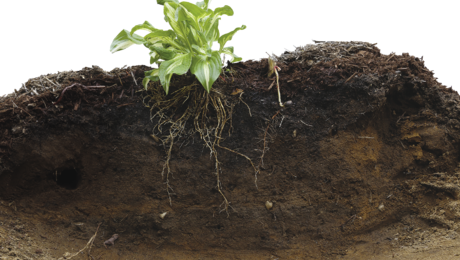 Soil is composed of two parts: minerals, which make up the nonliving portion of the soil, and the food web, which includes minute creatures, also called soil biota, which bring the soil to life. Soil biota come in many forms. Some help to build healthy soil and support healthy plants, and these are considered beneficials. 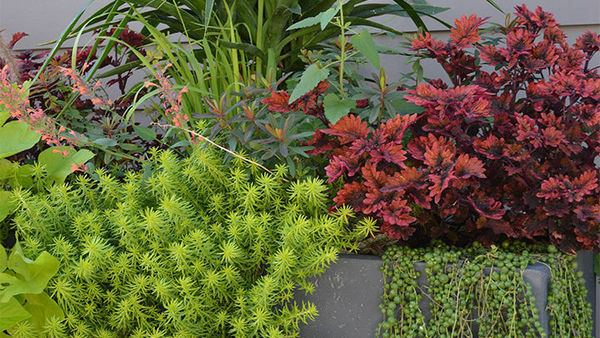 Others can cause many problems for gardeners, from root rots to blights, molds, and mildews, and are considered pathogens. Both have a legitimate and important place in the growth and decay cycles of the natural world. In the garden, we prefer to boost the growth of the beneficial biota and suppress as many pathogens as we can. When we improve soil tilth, texture, aeration, drainage, and nutritional content by feeding our garden compost and other amendments, we tip the scales toward the helpful soil biota. When these beneficial biota thrive, the soil food web functions smoothly, and our plants flourish. Here’s a brief introduction to the cast of critters that create the soil food web and make the soil come alive. 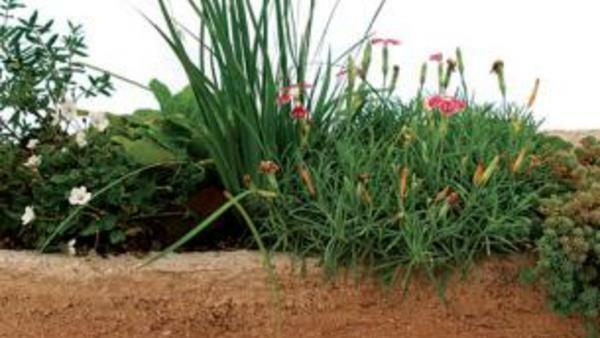 Our native soils are full of bacteria, both beneficial and pathogenic. A spoonful of ordinary backyard soil may contain billions of bacteria of thousands of different kinds, many of them specific to a region. In general, they help water move through the soil more easily, they recycle organic matter, and they help ward off soil diseases. There are many types of bacteria, but one of the most important groups is the nitrogen-fixing bacteria. They dine on particles of humus (organic matter), creating a waste product called bacteria manure that adds new forms of organic content to soil. Many plants absorb nutrients most efficiently through this bacterial waste product, so the more nitrogen-fixing bacteria in the soil, the better. Bacteria and bacteria’s waste products are also eaten by fellow soil dwellers of many kinds, so they feed other organisms in the soil in addition to feeding our plants. 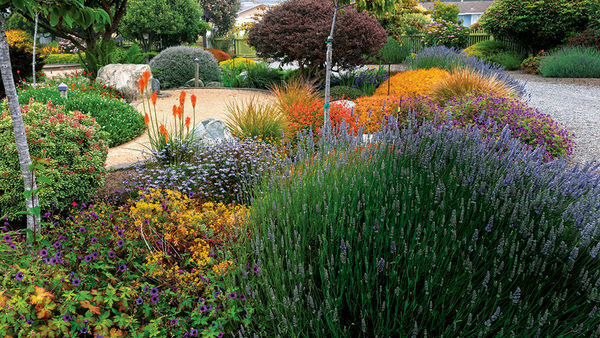 Lawns, flower beds, and most vegetables will flourish in soils dominated by beneficial bacteria. Worms are among the most beneficial of soil dwellers. Sadly, they are easily harmed or killed by exposure to many common pesticides and herbicides, including some weed-and-feed lawn products. Most gardeners cherish their earthworms, knowing that these hard workers are the soil builder’s best friends. 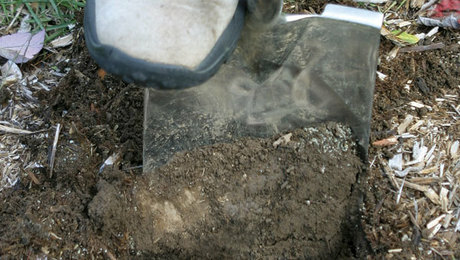 Worms do the mixing for us when we layer amendments onto garden soil. They tunnel through heavy soil to let air get down to plant roots. And their castings promote sturdy root growth and feed many soil dwellers. It would be hard to have too many worms, but soils suffer quickly when worms are in short supply. Most gardeners assume that fungi must be bad for the soil, but this is far from the truth. Fungi are vitally important to soil health, and beneficial forms are found in virtually every kind of soil on earth. Like bacteria, fungi break down organic matter by digesting and excreting humus, thus recycling nutrients through the soil food web. Mycorrhizae are among the best known fungi. They attach themselves to the roots of plants and create a mesh of fine feeder “rootlets” that act like pumps, pulling nutrients and water into the host plant’s root system. In effect, they increase the surface area of the roots and thus the plant’s ability to absorb nutrients. Healthy woodland soils are dominated by fungi, meaning that there are more fungal creatures than bacteria in the soil. To keep these woodland soils healthy, we need to maintain the fungal balance by letting the leaves that fall be reincorporated into the soil. 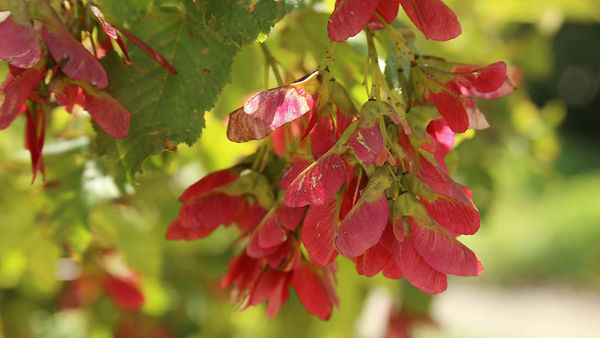 These leaves are often removed in the name of tidiness, but this robs the soil of critical nutrients. To prevent the leaves from smothering plants and to help the leaves decompose more quickly, simply shred them and return them to the woods as mulch. Since trees and shrubs grow best in a soil dominated by fungi, “parking out” woodlands by replacing understory shrubs with grass usually results in unhealthy soil and stressed trees. These recyclers are the critters that feed on bacteria, fungi, and earthworms, as well as plant particles. They include microarthropods— very small organisms like mites—and larger organisms like sow bugs, springtails, spiders, and centipedes. The microarthropods stay put in the soil, consuming debris and making nitrogen and other nutrients more readily available to plants and other soil biota. Arthropods also control the population levels of other organisms in the soil, keeping things balanced naturally. Nematodes, like fungi, are usually assumed to be pathogens, but beneficial nematodes abound in the soil. Good garden soil contains an ample supply of beneficial nematodes, which feed on many other creatures, from bacteria and protozoa to other nematodes, including the pathogenic ones. Nematodes support root growth, passing vital nutrients along to plants through their manure. Pathogenic nematodes eat live plant tissue, harming roots rather than promoting healthy root growth. 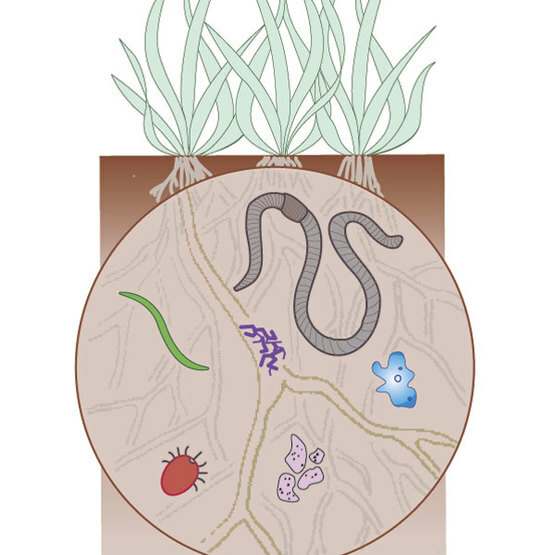 In healthy soil, beneficial nematodes help to keep their pathogenic cousins under control. Soil-dwelling protozoa are single-celled organisms that eat bacteria, keeping the bad bacteria in check, and produce a manure rich in available nitrogen, which can be taken up by plants. Protozoa are a favored food for nematodes and other soil fauna, which, in turn, release nitrogen and other nutrients back into the soil as they excrete. On the end will kill us all!